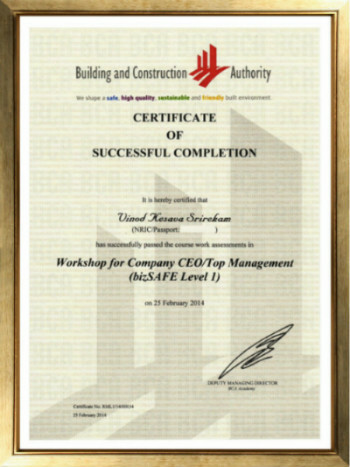 Mr Vinod Kesava, COO, The GreenAsia Group Pte Ltd, recently completed the Workshop for Company CEO/Top Management bizSAFE Level 1 run by Workplace Safety & Health (WSH) Council. Established in 2008, Workplace Safety and Health (WSH) Council functions to promote safety in the workplace and recognize companies who are in compliance with their guidelines. bizSAFE is a programme which is administered by WSH tailored to assist the Small and Medium Enterprises (SMEs) to build up their workplace safety and health capabilities. The programme provides a 5-level approach to help SMEs progressively build up their capabilities. SMEs participating in this programme will gain recognition and benefit from having a comprehensive WSH system in place, which recognizes the importance of employees’ safety and health.